Each color has 3 dimensions or attributes, Hue (H), Value (V) and Chroma (C). Hue is assigned a number and letter(s) which represents the color. Value and Chroma are assigned numbers. This is referred to as the Munsell notation. 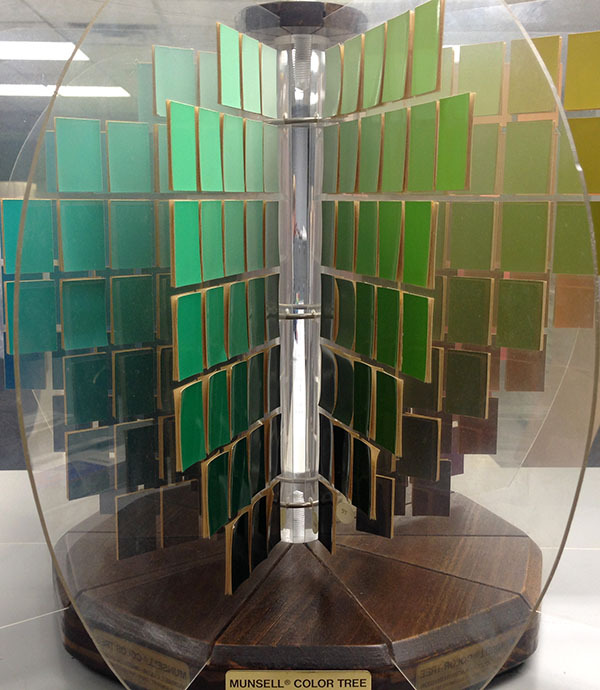 So why did Munsell choose a tree to represent his color space? We break down each dimension to explain how they relate visually to the tree concept. – making up the 10 panels on the color tree. The trunk of the tree represents value, the lightness or darkness of any color. Values in the Munsell color system range from 0: for pure black – at the root of the tree, to 10: pure white – at the top of the tree. As your eyes move vertically from the top to the bottom of the tree, the value goes from light to dark. Chroma is the brightness or saturation of a color. On the color tree, the branches extend from the center out horizontally to represent the chroma scale, moving from low to high chroma. Branches on a tree are not always uniform in length, just like the colors, which have varying levels of chroma. Low chroma colors are weak, while high chroma colors are strong and more vivid. For example, 5R 5/7 is weaker than 5R 5/10. Colors move from light and lower chroma, at the top of the tree, to dark and lower chroma, at the bottom of the tree. 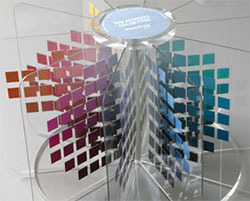 The Munsell color system comes to life with the color tree, making it easy for anyone to understand the attributes associated with color, the relationships colors have to each other and how to determine color notations. Has the color tree helped you learn to understand and communicate color better? We would love to hear your story. Want a color tree of your own? Click here for the new edition. 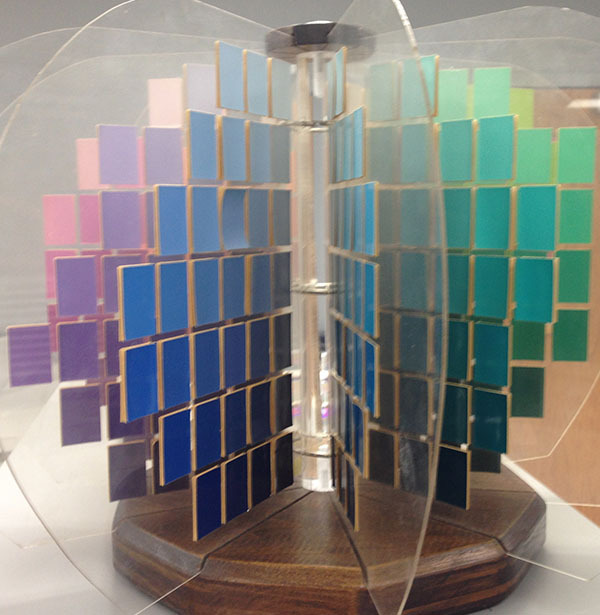 The Munsell color tree was a fixture in my office the years I taught color at Ohio State. I would have the students first derive the the three attributes of color perception by comparing and contrasting color swatches until those three attributes were discovered and agreed upon. I then told them if they discovered a 4th attribute to let me know and we would publish a book and become famous. 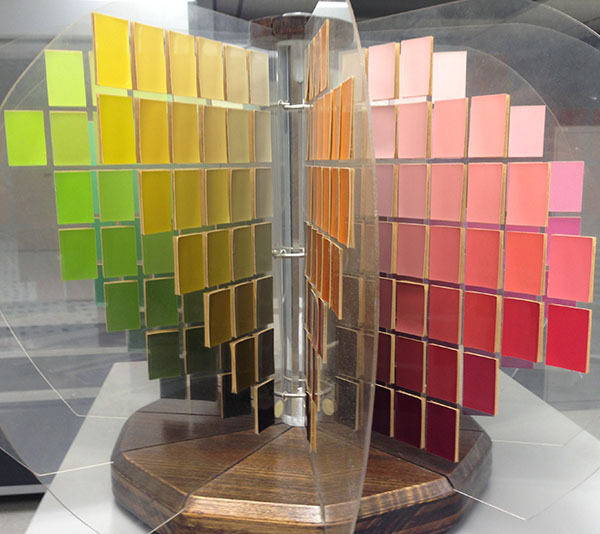 Hi… what is the equivalent of 5.0Y 8/12 in the RAL color system. Is there an equivalent color sample to 5PB2/8? RAL, Fed Stan, Pantone? What is the equivalent Munsell International Color Code for Nippon Paint 3S-756, Green? What is the equivalent Munsell International Color Code for Nippon Paint 3S-736, Green?